When Laura Belle Martin passed away, my great grandmother, Laura Belle Yarbrough, was only three years old. Alexander remarried to a lady named Mary (Dib) Kirlacy. Dib and Alexander had several children that would be Laura Belle's half siblings. My family remembered Virginia, Sally, "Betsy", Sam. Bessie was 9 years old in the 1920 census. I have seen on other family trees, but have not yet verified that Lorene (Sally) was born in 1924 and died in 2002 and Virginia Ruth was born on 03 Mar 1928 in Clarksville, TN and died on 26 Apr 1976. Laura Belle Yarbrough married Barnes Maynard, the son of James (Jim) Henry Maynard and Callie Potter  on on 23 Sep 1917 in Clarksville, TN, becoming Laura Belle Maynard. According to a story I got from my first cousin once removed, Callie (my great, great grandmother) once told her (my cousin), Barnes and his family went out west in a covered wagon and settled somewhere in Oklahoma. But Barnes and Laura had fallen in love before they left and Barnes wanted to come back and marry her so the whole family came back with him. Laura and Barnes had Robert Earl , Helen Paulene . They appear in the 1920 census as Laura and Barnes "Mayner", 19 and 21 years old, respectively with a 5 month old Robert Earl. They appear in the 1930 census with a 10 year old Robert E and a 5 year old Helen P.
Laura Belle died on 9 Dec 1983 in Montgomery Co.,Tennessee, USA  in a car accident. Willie was driving and the other car hit them on her side. 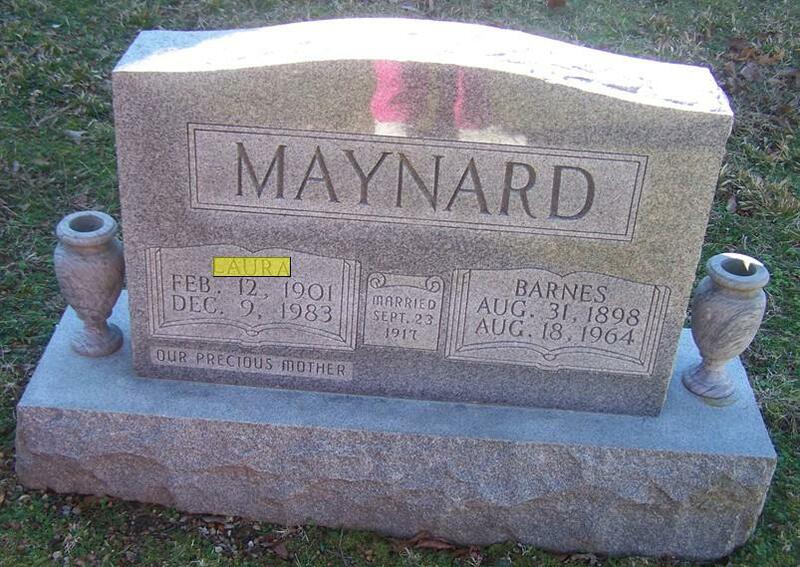 She was buried in Cunningham, Montgomery Co., Tennessee, USA. in Hopewell Baptist Church Cemetery next to Barnes. Norwood, Carrie. "Laura Belle Yarbrough." Roots and Blood. 07 May 2013. Carrie Norwood. <http://rootsandblood.blogspot.com>. 3. Social Security Administration. Social Security Death Index (Online publication). 4. "Tennessee Marriages, 1796-1950," database, Family Search (familysearch.org : accessed 16 Feb 2012). 6. The Leaf Chronical Obituaries (Published July 13, 2005 in B2 of the Local section), Leaf Chronicle - Clarksville, TN, Obituary of Helen Pauline Sinks. 8. Ancestry.com, 1920 United States Federal Census (Online publication - Provo, UT, USA: The Generations Network, Inc., 2005. For details on the contents of the film numbers, visit the following NARA web page: NARA. Note: Enumeration Districts 819-839 on roll 323 (Chicago City.Original data - United States), Year: 1920; Census Place: Civil District 19, Montgomery, Tennessee; Roll: T625_1756; Page: 10B; Enumeration District: 166; Image: 1014. Note : Appear as Barnes and Laura "Mayner"
9. "Robert Earl Maynard Obituary." Sykes Funeral Home. 22 July 2009. 09 June 2012 <http://www.sykesfuneralhome.com/robert-earl-maynard/>. 10. Ancestry.com, 1930 United States Federal Census (Online publication - Provo, UT, USA: The generations Network, Inc., 2002.Original data - United States of America, Bureau of the Census. Fifteenth Census of the United States, 1930. Washington, D.C.: National Archives and Records Administration, 1930. T626). following NARA web page: NARA.Original data - United States of America, Bureau of the Census. Thirteenth Census of the Unit), Year: 1910; Census Place: Civil District 18, Montgomery, Tennessee. This work by Carrie Norwood is licensed under a Creative Commons Attribution-NonCommercial-ShareAlike 4.0 International License.